Defying Gravity is a 501(c)3 non-profit, established to support youth climbing in Missoula, Montana. 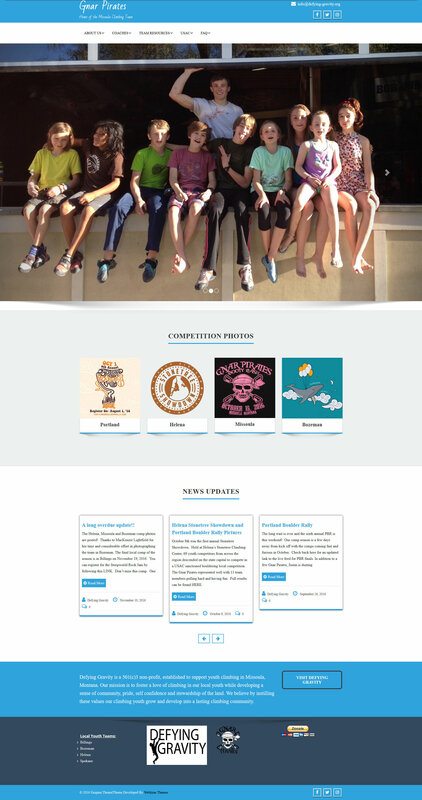 They came to me wanting a fresh new design for gnarpirates.org to really bring it to life and portray the fun, competitive nature of the kids’ climbing team. They were currently using WordPress with a pretty basic theme and did not feel that it was working as well as it could be. My re-design starts with learning the story behind the current site. Before I could start re-designing the site, I needed to familiarize myself with the current site. They thought the site functioned okay but needed an outside perspective to really polish and improve the website. They had a lot of important information that needed to be available for parents, and sponsors. It functions okay but it needs a non board member perspective and polish, and well a lot! Gnar Pirates’ site was a pretty standard WordPress with an un-modified theme. The information was there, but as a designer I could see the site was lacking that design flair to really help bring their story to life. Some of the navigation was confusing and took too many clicks to get to the info needed. The homepage also had a tendency to auto scroll and kick you out of your spot as it rotated through blog posts of varying lengths. Because Gnar Pirates’ site was already functioning, it was essential that I be able to re-design and improve the site while keeping the current site live. I decided to set up a development site that was an exact copy of gnarpirates.org so that I could work without worrying about the site going down for the public. Even though this was just a re-design of a new theme, there were a lot of plugins and information to work with, and you never know what challenged might pop up. The original site was then updated by pushing all changes from the development site and updating the database. The new design needed to be visual and help show off what Gnar Pirates are all about. I knew early on I wanted to display a lot of information on the homepage that would link to the most important pages of the site. 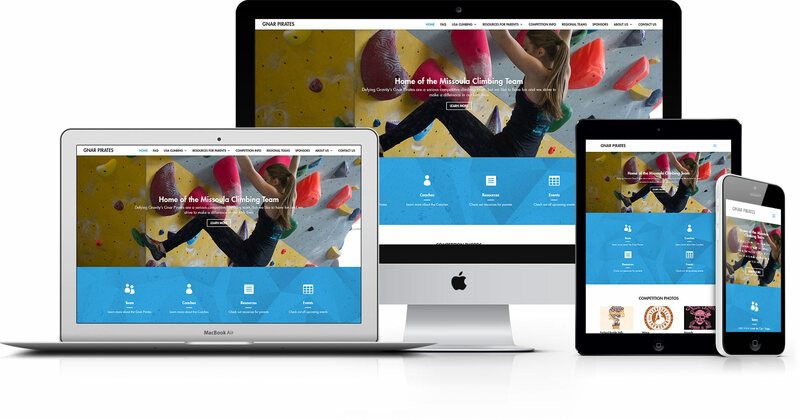 …a place to showcase what we do, specifically, what our kids do at climbing competitions. You can do a lot with great images and they had a lot of amazing photography. Photos of the kids competing were used in the top slider of the new design, while galleries of specific completions, and a general gallery were also included. There was an emphasis on portraying what the kids do and the fun, competitive nature. This way the kids and their parents got to see them climbing, as well as sponsors and donors. It was important to make the information as easy to find as possible. The homepage was given that ‘one page website’ feel so as you scroll down, you’ll find brief information on the team, coaches, events, competition galleries, quotes, blog posts, and sponsors. I combined some related information into single pages so that the user was not having to go back and forth between pages. A dedicated page for sponsors was created so the team can recognize their support and solicit new donors. And most importantly, there are as many photos of smiling kids as possible! The re-design was made into a responsive WordPress theme so that everything looks awesome on desktop or mobile. It was important that board members of Defying Gravity were able to update and maintain gnarpirate.org themselves. I used a framework that is very modular and allows people with no coding knowledge to add/change images, move sections around, and even add different features and elements. Expanding our brand as we continue to grow is a constant challenge, both physically and financially. Developing an “electronic” footprint and brand are crucial to our success in fundraising, community awareness and growth. Kiondra addressed all of our non profit needs in a professional, timely and most importantly, friendly and easy going manner.